I'd like to know if we'll enjoy one day a french translation of 4.20 beta ? Or when 4.20 beta will become 4.20 final (with a french translation) ? Most likely the next release version will be when Windows 10 becomes close to final. I don't know when that's going to happen. But when it does, it will have a French translation. Until then you can manually install the French translation for version 4.1.0. It should work fine except for one or two new settings that will be in English. Thx very much, I do appreciate Classic Shell. With "Classic Shell Update", in french, when CS is up to date (after having "verifier maintenant"), the windows says "Votre Version Classic Shell est actuellement". wich means absolutely nothing in french or is perfectly incorrect. 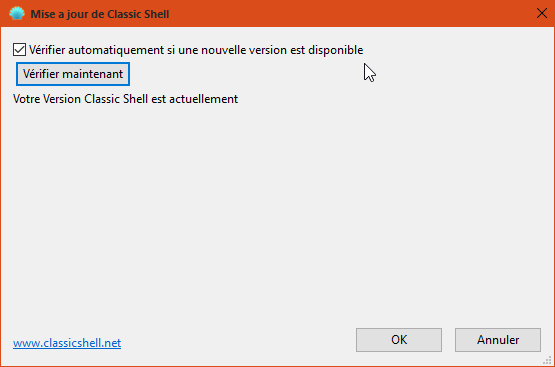 The right sentence is "Votre version de Classic Shell est à jour.". Post scriptum : It could be also "Votre version de Classic Shell est actuellement à jour" but that's not really correct neither. Prefer "Votre version de Classic Shell est à jour." Thanks for the french support !